The ferry, which was delivered by the country's Søby Værft shipyard, was ordered to replace the previous one that had been running for over 40 years and reached the end of its operational lifetime. 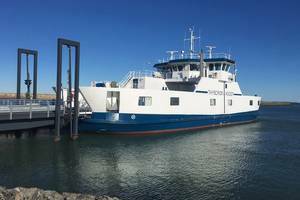 Kim Raabjerg Korshøj, Crossing Leader of the Thyborøn-Agger ferry, commented: "Danfoss Editron's system was smaller and lighter than other products by a weight equal to four cars, meaning it was the perfect choice to be used in our new hybrid electric ferry. The space savings and high efficiencies mean that, even though the new ferry is larger than the old one, it is expected to have a lower operational cost per crossing due to the savings in fuel and the reduced maintenance needs."